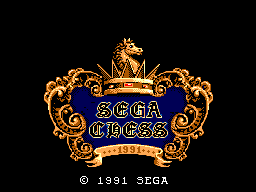 Chess has been around since forever, and SEGA really embraced all the greatness that the glorious game has to offer even with this simple video game. Play against a CPU opponent, play with a buddy, watch two CPU players go at it, or even play by yourself with a dummy player. There are many difficulties for versus CPU opponents, the highest being programmed AI based off of ten of the best chess players in history, one of them being the legendary Bobby Fischer. If you win at that level (or if you complete a dummy game with that level selected) you get to see a neat ending sequence as well as the credits. The graphics are excellent, 2D and 3D alike. The pieces are excellently rendered, as is the 3D board. 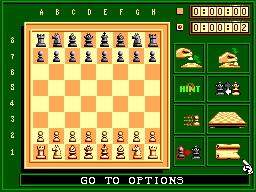 The controls are simple, however the game is not thoroughly programmed to accept every possible type of move performed in Chess (0-0-0 or queen side castling is sometimes not recognized and pawns cannot side capture en passant). This game is excellent; I personally would never, ever stop playing, and it is always going to have someone interested. Its chess! How could anyone pass it up? I recommend this to everyone, well except the very, very young (try Checkers or Nine Men's Morris). 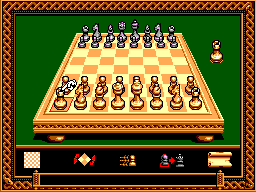 Great game, great video game, can never go wrong with Chess (just don't get on it-its BAD luck).